DPW Auctions uses the same Max Bid proxy approach as eBay. When you place a bid, you are specifying the maximum you are willing to bid. This may be larger than the required minimum bid. If the maximum bid you entered is larger than the required minimum bid, then you are agreeing to allow DPW to automatically place bids on your behalf, up to your entered maximum, as others bid. This is why the approach of maximum bidding is so convenient - you declare the maximum you are willing to pay and then you can walk away until the auction is over. 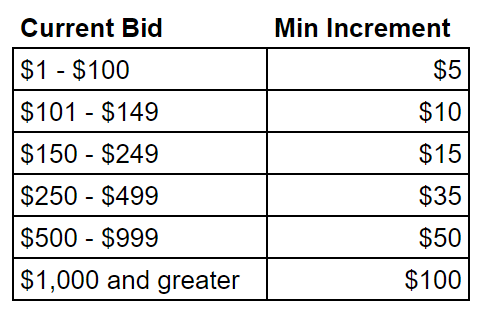 When DPW does place an auto-bid for you, it will increase your last highest bid by an minimum determined by the table below, however in no case will the maximum bid you entered ever be passed. The actual auto-bid increment may be more or less than this. It would be less if the minimum increment would increase your auto-bid to greater than your maximum bid. It would be more if someone else bids more than the minimum increment over your bid, while still bidding less than your maximum. Take for example, your max bid is $200 with your actual high bid being $102. If someone bids $150, an auto bid will be placed for you of $153, keeping you as the high bidder. This is done because your max bid of $200 is larger than the other bid of $150. If someone bids $200, equal to your max bid, you will still be the high bidder with a bid placed for you of $200. It is only when someone places a bid higher than your max, say $210, are you no longer the high bidder. If you are interested, take a look at the diagram of the bidding logic attached to this article (see below). Posted - Tue, Mar 29, 2011 at 4:19 PM. This article has been viewed 15605 times.